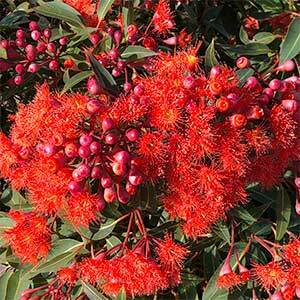 If you are looking for a small flowering gum, then Corymbia Mini Orange could be the one. Grown as a grafted specimen, these free flowering trees are very tolerant of a range of soil conditions although good drainage is essential. Making an excellent specimen tree, suitable for smaller gardens, or maybe use it at the rear of the garden border when in flower it will attract both bees and birds to the garden. Although small, ‘Mini Orange’ does produce a dense canopy and is a haven for small birds. Best planted in full sun in a well drained soil, Mini Orange will tolerate slightly more moisture as it is grafted onto a more tolerant rootstock. Light pruning directly after flowering will encourage a denser growth habit and even more flowers. Any shoots below the graft should be removed as they appear. Height – To around 2.5 metres. Flowering Time – Winter to Spring and Summer..